The Black Sheep Gallery was opened in 2000 and it is situated in a converted 1200 square foot fish plant on the shore of Jeddore Harbour. It is located less than one hour east of Halifax. The work of over 40 Nova Scotia folk artists past and present are featured, as well as a selection of folk art from Ontario and Quebec. 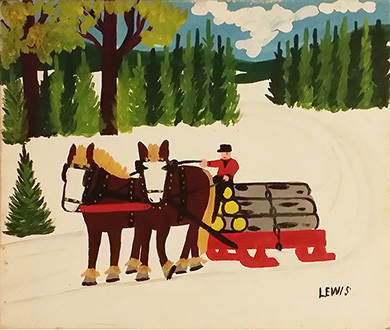 Canadian artists shown at the gallery include Maud Lewis, Joe Norris, Everett Lewis, Joe Sleep, Eddie Mandaggio, Angus Trudeau, Edmond Chatigny, Ewald Rentz, Barry Colpitts, Charlie Tanner, Leo, Ransford and Bradford Naugler. We also offer the work of several well known folk, self taught and outsider artists from the United States including Rev. Howard Finster, James Harold Jennings, Sybil Gibson, S.L. Jones, Mary T. Smith and David Butler. Click here to see our listing in the Discovery By Designers section of the Architectural Digest web site. All images contained herein, are copyright material. No duplication, copying, reproduction or representation of any of the within images, in whole or in part, is permitted without the prior written authorization of Black Sheep Gallery or its authorized agent.